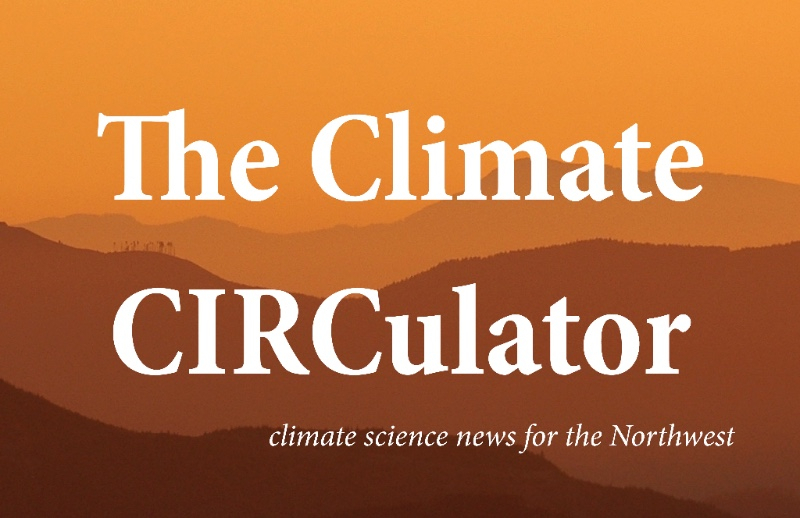 In this issue of the CIRCulator, CIRC researcher John Abatzoglou gives us an overview of the Pacific Northwest’s current snowpack numbers using the Northwest Climate Toolbox. It’s a story of haves and have-nots that has many wondering if we’re going to see another “snow drought” like the one we experienced in 2015. It is, of course, too soon to tell. The 2015 snow drought and whether the drought is a harbinger of future climate changes is the subject of a recent paper published in the journal Environmental Research Letters. The paper, led by Mariam Marlier of UCLA, looks at snowpack during the 2015 drought in the Cascade and Olympic mountains of Washington state. What was noteworthy about the 2015 drought, Marlier and colleagues note, was not a lack of precipitation. Washington’s mountain ranges received a “near-normal” amount of precipitation from the start of November 2014 through the end of March 2015. (Here, “normal” is defined as the average calculated for the years 1950–2015. “Near-normal” is then something close to the average experienced over winters within that time period.) Precipitation levels weren’t especially low, but temperatures were especially high. In fact, temperatures over the 2014/2015 winter averaged 2.1 degrees Celsius (roughly 3.8 degrees Fahrenheit) warmer than the historical average (again 1950–2015). The winter was—to put it bluntly—exceptionally warm. This meant that the near-normal precipitation that fell tended to did so as rain and not as snow. This, along with warm summer temperatures, eventually led to water scarcities across the region. Hence the name snow drought. Marlier and colleagues’ numbers illustrate the severity of the snow drought. The study’s authors—which included former CIRC researcher Dennis Lettenmaier—found that the snow water equivalent (SWE)—the amount of water contained in the snowpack if you melted it down—on April 1st, 2015, was 325 millimeters (a little over a foot) lower than normal in Washington’s mountains. The April 1st measurement accounts for all the snow that has accumulated over the previous winter. Years with low April 1st snowpack measurements often see low flows in rivers and streams during the summers that follow. Low snowpack years can also experience more severe fire seasons. In 2015, snowpack measurements were particularly dismal in Washington’s Olympic Mountains, which saw 600 mm (nearly two feet) less snowpack than normal, making that year’s April 1st snowpack the lowest experienced on that date in the Olympic Mountains since 1950. Not surprisingly, missing one to two feet of snow-stored water helped dry out Washington’s forests and increase fire risk the following summer. Along with examining snowpack and temperature, Marlier and co-authors, which included CIRC’s John Abatzoglou, also examined the moisture content of dead, woody vegetation as a surrogate for fire danger. This dead, woody vegetation becomes fuel for forest fires. The drier the fuel is, the likelier it is to catch fire and burn. The moisture content for dead fuels was 2.9% lower than normal in Washington in 2015, corresponding to a higher-than-normal fire risk. The largest declines in fuel moisture were in the Olympics, which experienced the Paradise Fire in the rainforest on the Olympic Peninsula during the summer of 2015. So, is the 2015 snow drought a harbinger of things to come? Most likely, according to the study’s authors. Using future climate and hydrology data from CIRC’s Integrated Scenarios project, Marlier and colleagues conclude that the year 2015 looks pretty similar to what climate models project will become the new “normal” for the Pacific Northwest by the middle of the 21st century (2040–2069) under a mid-range greenhouse gas emissions scenario (RCP 4.5). The authors conclude that while temperatures during the 2014/2015 winter were of a similar magnitude as projected mid-21st century temperature norms (2.3°C or about 4.1°F above the historical average), the 2015 snowpack reductions were actually somewhat greater during the recent snow drought than the reductions projected by the mid-21st century. Projected snowpack in Washington’s mountains was only 252 mm (roughly 10 inches) below the historical average. OCCRI came to similar conclusions for Oregon snowpack during the 2015 drought in the Third Oregon Climate Assessment Report, which came out in January 2017. If you’re wondering how future snowpack projections could be not quite as bad as 2015’s snowpack, don’t worry, the authors provide an answer. The reason, the authors note, is because winter precipitation is projected to increase slightly in the future. That, if you’ll recall, wasn’t the case for precipitation levels during the 2014/2015 winter, which were at near normal levels but not above normal levels. Although here it’s worth noting that precipitation projections don’t share the same level of confidence as temperature projections. The authors conclude that the similarity between 2015 and projected future conditions suggests that future drought severity may be more dependent on temperature than on precipitation. In other words, we could see more snow droughts. And, note the authors, we can expect more severe fire seasons as well. Fire risk is projected to increase by the mid-21st century. Though, it’s not projected to be as severe as the 2015 fire season, according to the authors. Over the coming months CIRC will monitor evolving drought conditions and impacts in our region. Tune in to our upcoming series our upcoming series the Pacific Northwest Drought Early Warning System Drought & Climate Outlook Webinars. The next webinar is February 26th at 11 a.m. Pacific. For more on the 2015 snow drought, see our list of related stories below. Citation: Marlier, Miriam E., Mu Xiao, Ruth Engel, Ben Livneh, John T. Abatzoglou, and Dennis P. Lettenmaier. 2017. “The 2015 Drought in Washington State: A Harbinger of Things to Come?” Environmental Research Letters 12 (11):114008. https://doi.org/10.1088/1748-9326/aa8fde. Previous Post Winter Snowpack Numbers! Next Post Drying and Greening of the West?